We made it! What a long journey to get here though! In all we were in the air for about 20 hours on 3 separate flights and it took us around 27 hours total from departure to arrival. Wow. Asiana Airlines is amazing! I never want to fly internationally on an American carrier again! When we got off the plane at LAX we had to wait for the Asiana counter to open so that we could get our boarding passes. As we sat upstairs waiting we watched the staff of Asiana come out, what I took to be the manager addressed those standing in line in Korean, and then the entire staff bowed to the passengers. When we stepped on the plane and sat down we were first greeted with headphones for our televisions. Pretty standard. But then we were given hot towels (how refreshing!) and then SLIPPERS! 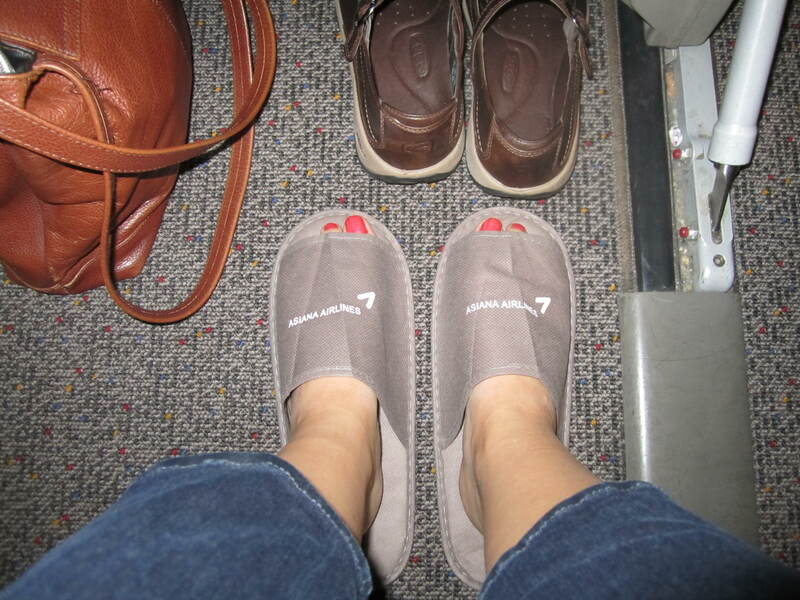 Seriously, every airline needs to give out slippers for their international flights – how comfortable! The meals were stellar – we chose the Korean meal, Bibimbap, a traditional steamed rice and veggie dish – and the attendants were continually walking up and down the aisle providing drinks and extra snacks. Did I mention that the wine and beer were also complimentary!? Plus the flight attendant uniforms took us back to a time that we never had the chance to experience – the “glory days” of American airlines, like PanAm. 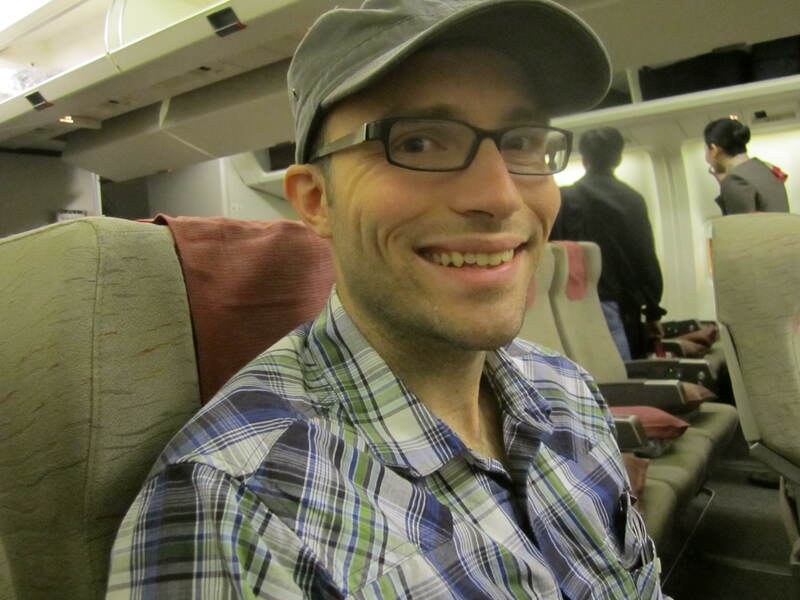 Overall, Asiana Airlines makes even Travel Class (coach) feel like First Class. Unfortunately our 2nd flight from LAX to Seoul landed about ten minutes late, not including the time it took to taxi to the gate and get off the plane. We rushed to security only to find that there was a huge line of people just like us whose connections were also about to leave. The line was moving incredibly slowly, one at a time, and even when the urgency of getting through security quickly was addressed to a worker, the line did not pick up. Luckily we made it through security with just enough time to rush up the escalator and run to our gate as they were boarding the final passengers. 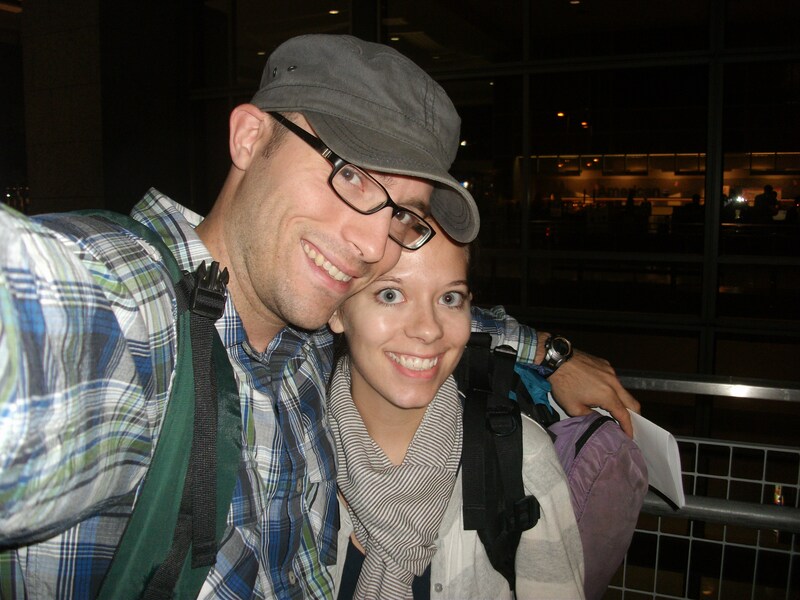 Once we finally arrived in Saigon (Ho Chi Minh City or HCMC) we went through immigration and customs only to walk outside the airport and be completely overwhelmed. There were crowd-control gates outside keeping several hundred people from going inside the airport while they waited for their family and friends to come outside. We felt like rock stars walking out of the airport to such a crowd of people. We were a little apprehensive about taking just any taxi because we have read the numerous accounts of people being scammed by their drivers – we tried to pick out the taxi companies that we knew were okay, but we weren’t allowed to handpick our cab, of course. Eventually we went ahead and just got in a taxi (one without tinted windows) and luckily, weren’t scammed or threatened by our driver. 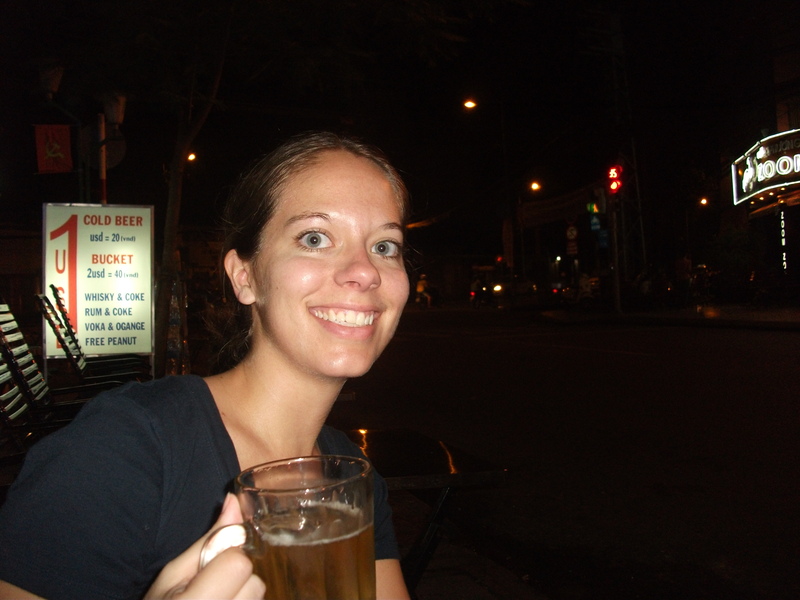 After arriving at our hotel, An An 2, we put down our bags and went out onto the street to look for some food and beer. 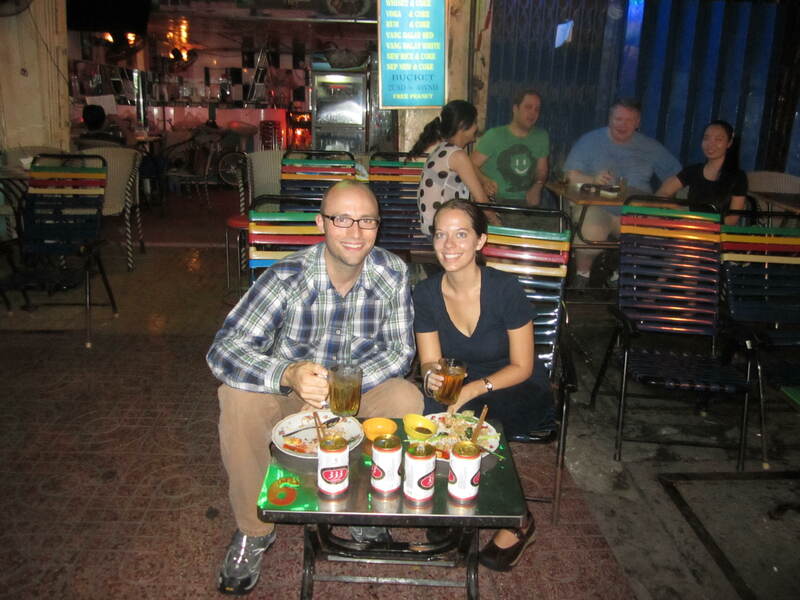 We were quickly pulled into a street-side place where we got a couple of beers each and some noodles and pork for about $8. As we ate, we were introduced to the begging problem in Vietnam, which we had read about, but for which I had not really been prepared. A least 4 or 5 people either approached us trying to sell small goods – flowers, nuts, rice cakes – or just outright begging by sitting in front of us waiting for us to give them money. It’s something that we will probably deal with everywhere and I’ll just have to get used to it. 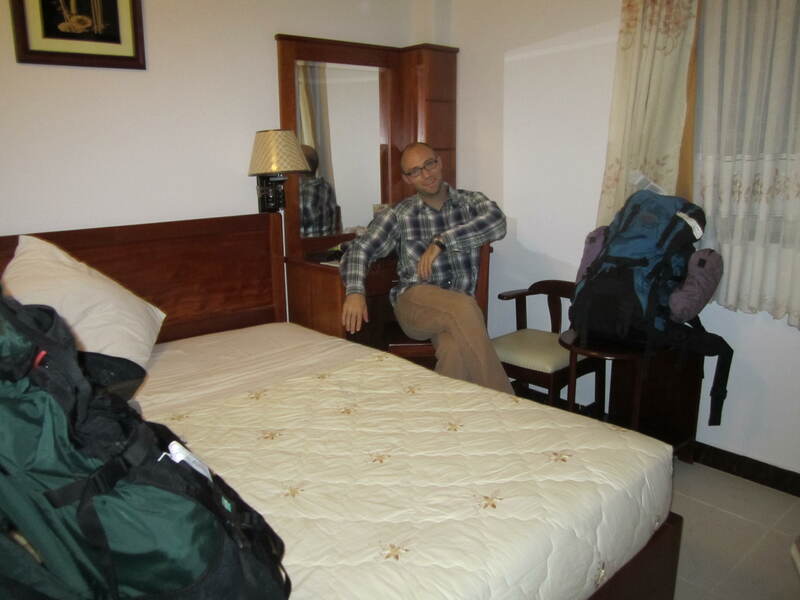 Now we are going to head out for our first full day in HCMC.